Valentine’s Day is two weeks away – are you feeling the love? Even though I don’t have a valentine this year (does Ryan Gosling count? ), I plan to make the most of this holiday. Growing up, my mom made Valentine’s Day fun and memorable. In the morning, we’d find a small gift next to our breakfast and receive candy to eat after our family dinner. She also made it a point to decorate our house with cute little heart-shaped accents and use pink and red paper plates, napkins and tablecloths for meals. Sure, grand gestures are a fun aspect of Valentine’s Day (if anyone wants to get me a diamond, please feel free), but it’s the small, handmade touches that you’re sure to remember. 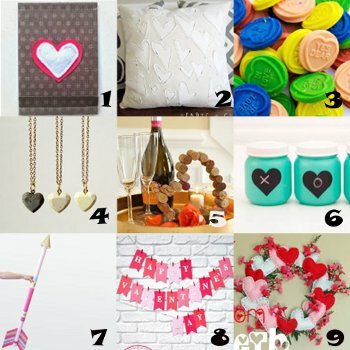 In the days leading up to Valentine’s Day, start decorating your space and wearing heart-shaped accessories. A Crocheted Heart Headband is perfect for little girls but moms can make one for themselves as well. This pattern for this adorable headband is extremely simple, making it ideal for beginners. You can also add a pretty handmade wreath to your door. Go green and make a Valentine’s Coffee Filter Wreath or show off your rustic side with a Charming Valentine’s Day Wreath. You might think these projects are complicated but they’re actually so easy to make! Valentine’s Day doesn’t have to be about romance. Embrace the best aspects of the day and create adorable DIY designs that you can show off all year long. Even the smallest handmade item can brighten your day or make someone smile. What’s your favorite Valentine’s Day tradition?